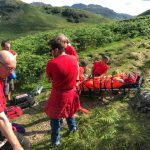 Incident Details: A classic example of what we get called to is not quite what it seems…The initial call was to what was assumed to be a straightforward broken ankle of a walker at the head of the Newlands valley, on a lovely summer’s evening. So most set off in T shirt and shorts, thinking we’d be back in a couple of hours. When we arrived, it was to find this was in fact a lead climber who had fallen 10 metres off Miners Crag, landing on his ankle. This was by way of celebration of his 63rd birthday! Because it was a fall from height, he was treated for possible spinal damage, and the Team requested an S92 helicopter to winch him out from what was an unstable boulder field, just beneath the crag. He was splinted and then carried out to a point suitable for the helicopter to winch. Rescue 936 from Caernarvon attended, but because of the stiff breeze blowing up the pass, took some time to align itself ready for what turned out to be a 40 metre winch into the aircraft. The casualty was then flown to Furness General in Barrow. 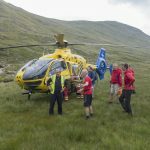 The Team then extricated itself and kit from the boulder field, and walked back down to the vehicles at Castle Nook, arriving back at base some four hours after callout. 18 Team members – 4 hours.